Harmonics are often overlooked – either for a lack of understanding or for a focus on the symptoms of the problems harmonics cause rather than the underlying source. However, after decades of cleaning up power quality issues around the world, we understand the importance of proactively mitigating harmonics. Within the last 30 years, energy-consuming devices have changed. Loads, such as computers, telephones, monitors, electronic lighting ballasts, LEDs, and motor drives consume power differently. These devices draw current in a nonlinear (non-sinusoidal) fashion, and in doing so, severely affect the system and its loads. 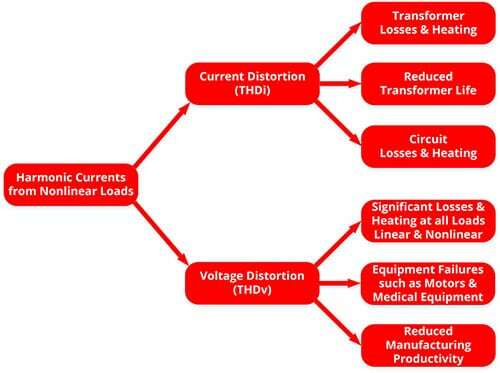 These nonlinear loads increase both voltage and current distortion in the electrical system, which leads to significant energy losses, shortened equipment lifespans, and reduced efficiency of devices. Properly mitigating harmonics requires a system-wide approach since just treating one aspect of a system often results in different problems arising elsewhere. This is why we work with owners, managers, and their engineer professionals to make sure the electrical system matches the electrical requirements of the loads in the most effective, efficient, and cost-effective way possible.